A safety audit is conducted in compliance to certain regulations and set laws. It is a process of collecting information that are relevant to the safety management and procedures of an organization. It also helps identify hazards, risks and the overall health of the people in the organization. This includes planning and designing for actions to take in a health and safety program. It is best to conduct audits regularly, regardless of what type of audit is being done. Different types of audits are done to inspect different parts and activities of an organization that are regulated by certain regulations to ensure that they are compliant to the set rules and standards. In this article we will be discussing about safety audit reports and other important things to learn about it. Samples and templates are also included for you to use as reference. 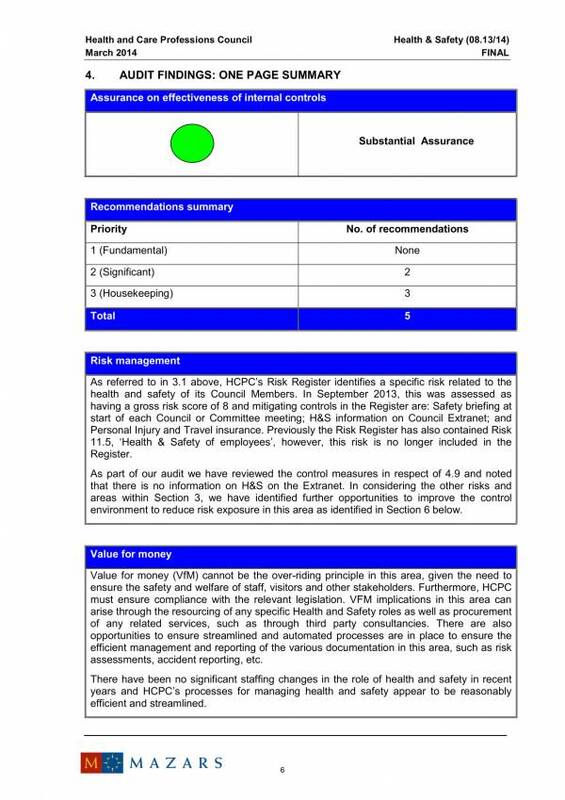 What Is a Safety Audit Report? 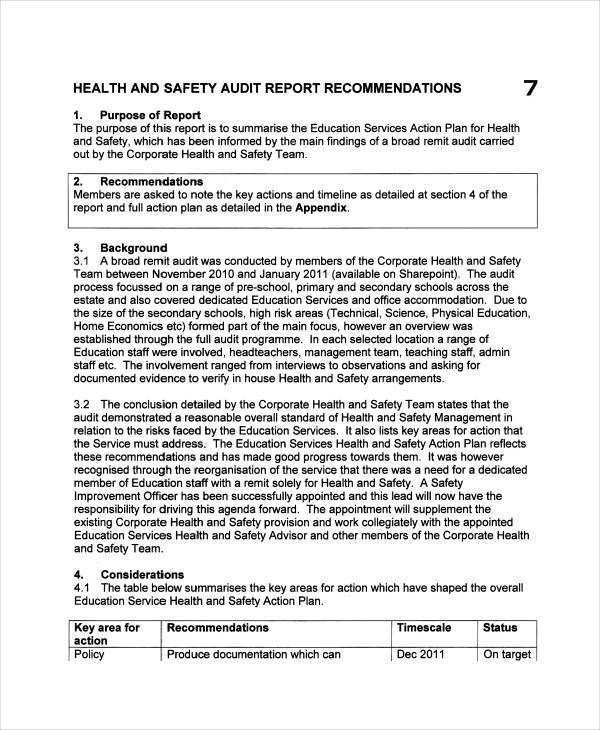 A safety audit report is a document where the data gathered from an audit is presented together with the record of the results of outcome of the safety audit done. 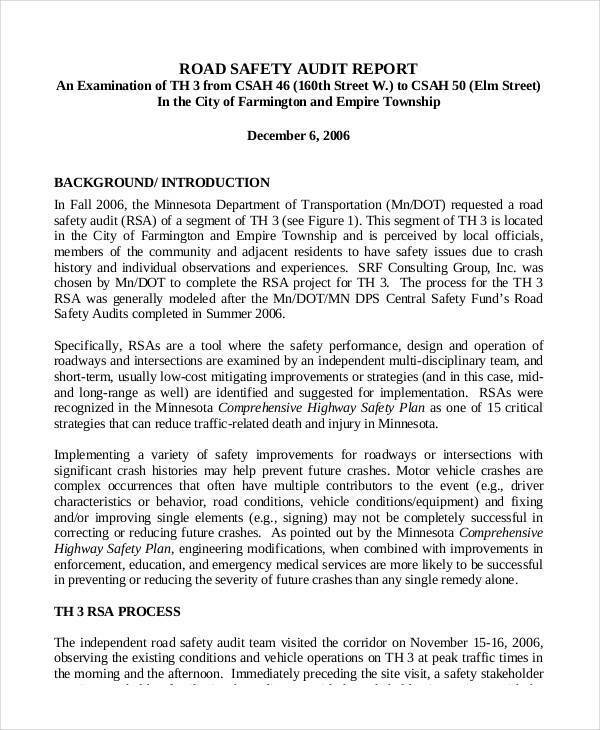 The information that you will find in a safety audit report are information about whether the company or organization is complying to the health plans and safety arrangements set by the government or not, if the the arrangements are implemented or not, if it was effective, if it was able to identify any failures in the system, etc. There are three types of safety audits and they are compliance audits, program audits, and management systems audit. These three types help evaluate different safety practices and determine violations. Compliance audit – This is the most basic type of audit. In a compliance audit, the adherence of an organization to set laws and regulations are inspected or reviewed. The audit ensure that the organization is functioning in accordance to the regulations and not against them. Having good results in a compliance audit is an advantage, which gives the organization a good name and standing in society. Some of the thing that a compliance audit inspects, include the organization’s finances, payroll, record-keeping practices, employee training, the provision of employee benefits and many more. A compliance audit also determines if the particular organization is able to provide a healthy and safe work environment for its employees. 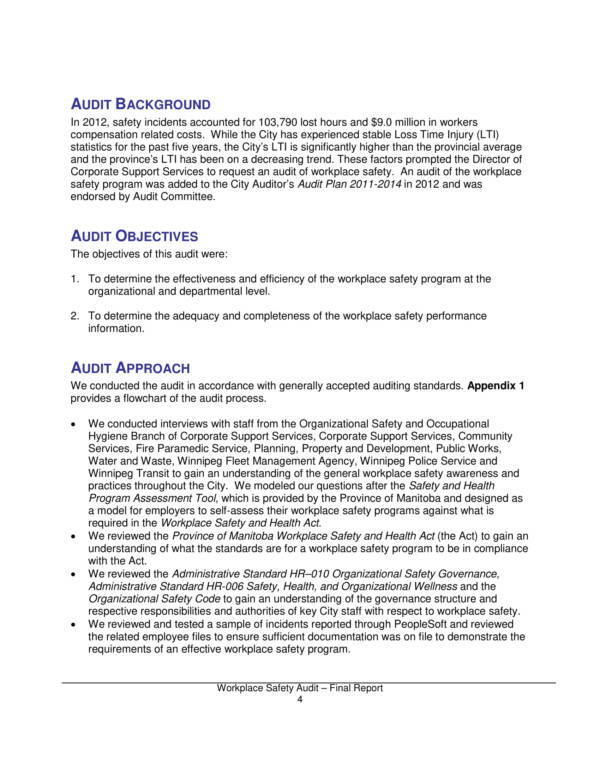 Program audit – This type of audit is concerned or focused on the safety programs of an organization, how it is implemented and the requirements or rules to maintain a safe work environment. 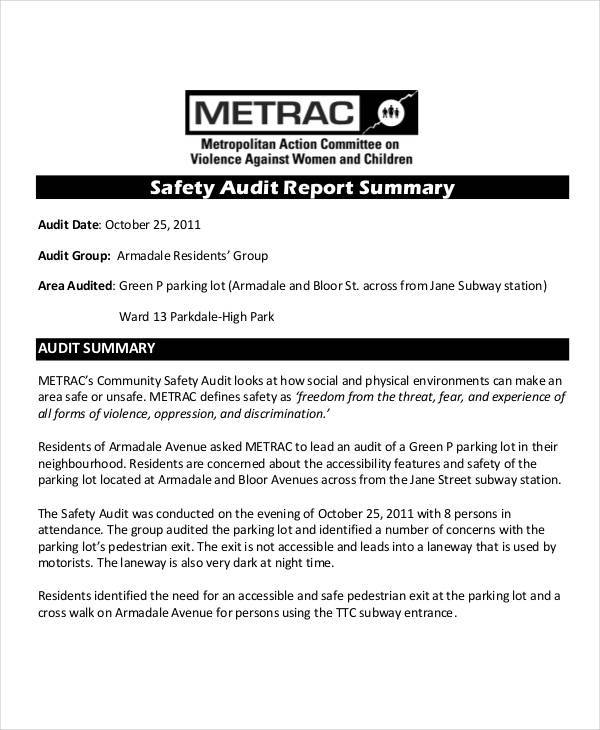 The audit is done to find risks or potential risks so that they can be corrected. Management systems audit – This type of audit validates and evaluates how committed the organization is in the implementation of safety compliance and programs, risk control programs, etc. The evaluation if about determining whether the steps taken by the organization are effective. Other related topics, include Clinical Audit Report Template and Internal Audit Report Templates. Why Is There a Need to Conduct a Safety Audit? The nature of a job may at first glance look harmless and safe. Pretty sure your employer would keep you safe within your company’s premises as it is their job to do so. However, no matter how safe you may think you are in your workplace, there will really be certain hazards that you might not be able to notice, unless it is thoroughly inspected and fixed. If left as it is, these little hazards will affect the health and safety of all the employees in that workplace. This is where safety audits become useful. 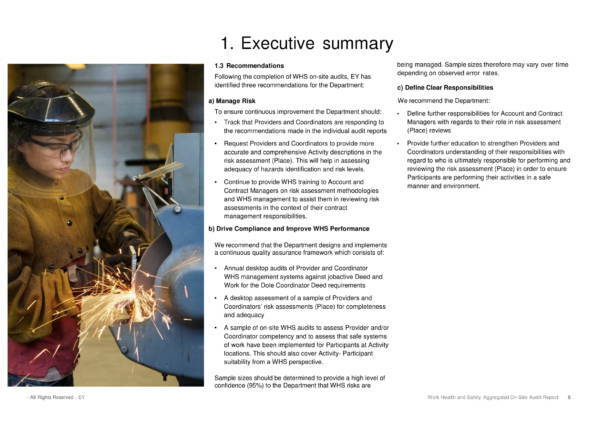 Here, we will get to learn the reasons why there is a need to have a safety audit conducted. How can you determine if the health and safety programs you have planned and implemented in your organization are working? 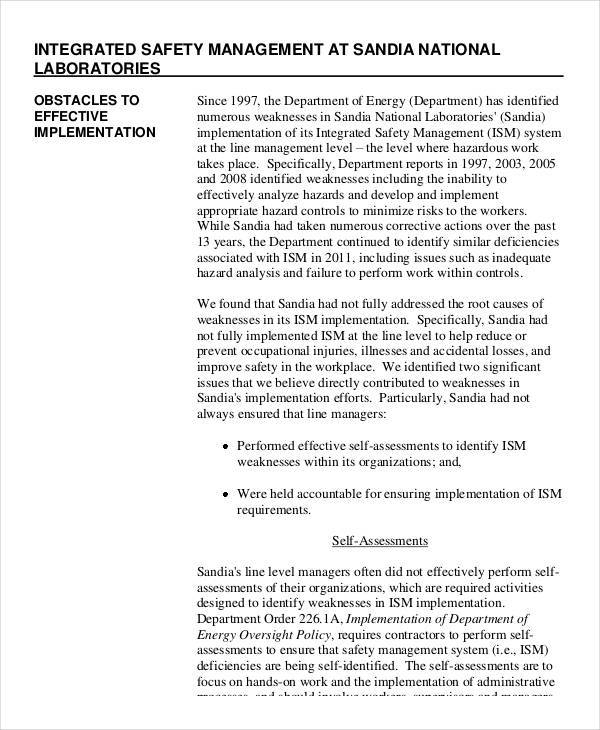 The evaluation and verification of the effectiveness of the programs being implemented are done in a safety audit. A safety audit allows you to verify if the all of the employees and members of the organization are involved in the health and safety programs that you have implemented. The level of compliance of your company organization to standard rules and regulations are verified in a safety audit. Another reason why a safety audit is conducted is to inspect if you are making proper documentations regarding the safety programs and activities that has been implemented in the organization. You will be able to find potential hazards to your employees and the rest of the organization. This way they can be avoided before any harm or accidents take place. Through a safety audit, the safety of the workplace can be determined and can be proven using the data gathered during the audit and through the results of the safety audit. The safety of the equipment used in the workplace are also determined by conducting a safety audit. This is when you, as an employer, will need to take action and fix these equipment as soon as possible before anything bad happens. Adequate safety training of both the management and the employees is also necessary. Safety audits also check or inspect if the training provided is adequate. If you have a safety audit conducted and you get good results, it means that you are compliant to the law. If your organization is compliant to the law then you will gain recognition and trust from different clients and other entities. This will help your business grow even more. Regulatory agencies will be in your favor if you see to it that a safety audit is conducted regularly. Conducting a safety a audit is one way for you as an employer to indirectly show your employees that you care about their health and well-being. How? By doing safety checks you assure them that you are keeping and maintaining a healthy and hazard free work environment. There are sure plenty of reasons why a safety audit is conducted, but we can only provide those listed above. Also, other reasons for having a safety audit conducted depends on the goals and objectives of the organization. You may also want to check out related articles, like Sample External Audit Reports and Audit Schedule Samples and Templates. What Is the Difference Between an Audit and Inspection? We refer to an audit as an inspection of the accounts of a particular organization or institution so we come to the conclusion that they mean the same thing. But is it really right to assume that an audit mean the same thing as an inspection? Truth is, these two words may be used in the same field and the same sets of activities, but they are actually different. An audit is conducted to verify the level of compliance of an organization to standard laws and procedures. Its main purpose is to make assessments on what the company or organization has been doing to comply to the law. The assessment done provides results that can be used to find ways or plan ways on how the organization can improve and make things better. But it doesn’t provide ways on how to make improvements and plans on how to do things better. An inspection on the other hand is more on the act of doing a set of tasks that needs to be done. In other words, it follows a specific list of steps or tasks that has to be completed. Inspections are done to be able to comply to specific regulations while an audit is done to asses if the compliance have been met. 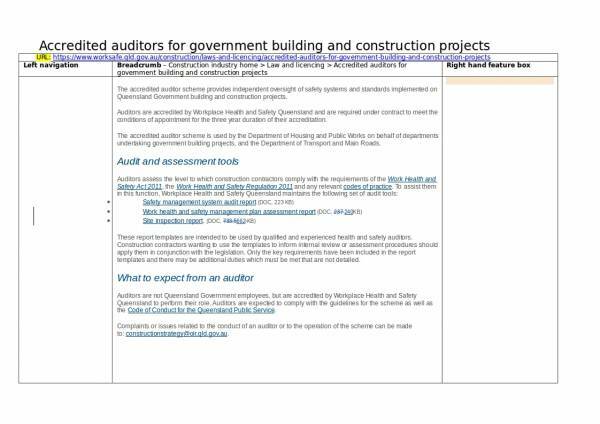 Check out more articles related to this topic, like Audit Plan Samples & Templates and Audit Quotations. If you are wondering if there is an easy way to create a safety audit report, then the answer is yes. 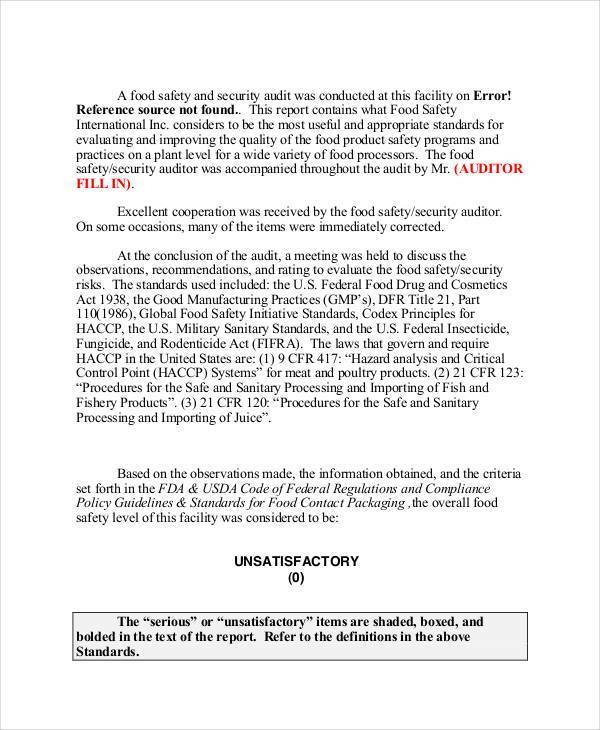 safety audit report templates are created for that purpose. It is not only limited to making the task easy, there are also other advantages that it offers to its user. 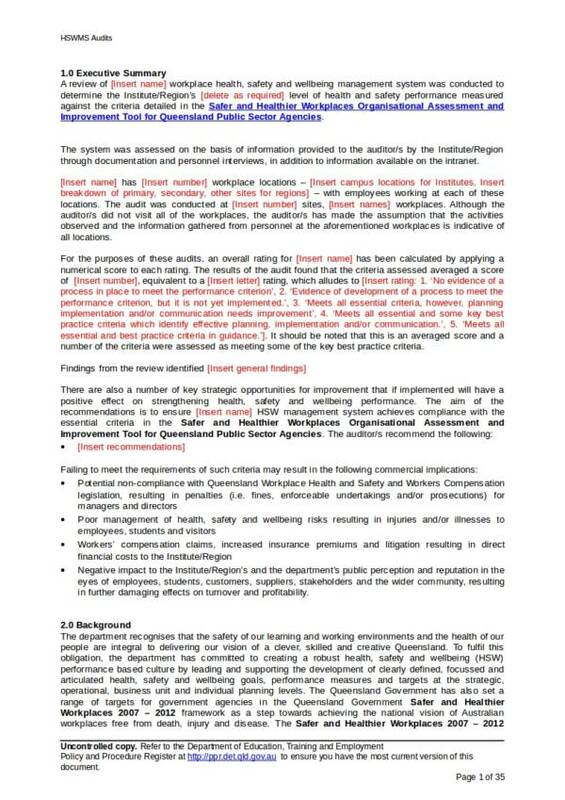 A safety audit report template is a great time saver as you no longer have to create the report template from scratch. You can use the appropriate template as your own just by filling in the required information and details. There are a number of free templates that you can pick and download online so you will not have to worry about any issues related to scarcity of the template. 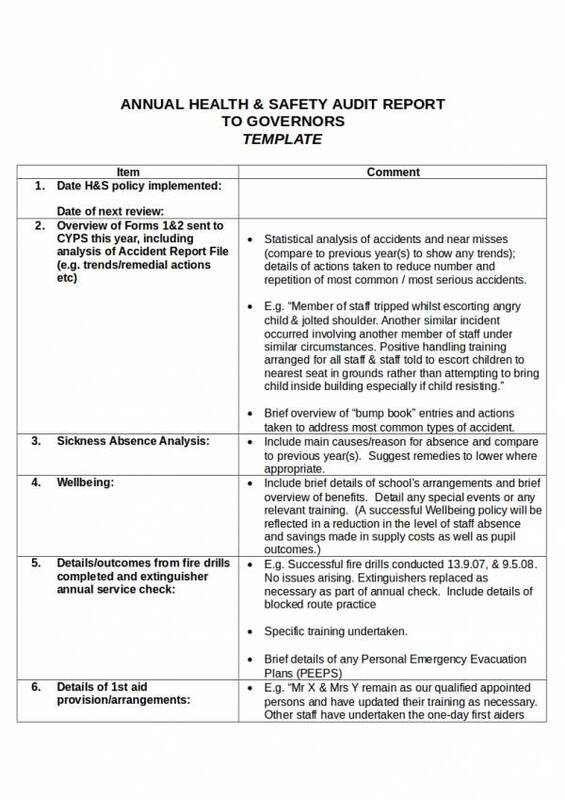 A safety audit report template can be used as a guide or reference if you prefer to create your very own report template. The templates are easy to edit and change based on your preference. They are available in easy to edit file formats that are also familiar to us, like PDF and Word. The use of the tool has proven itself effective and worthwhile in a lot of fields of work. You can guarantee that you will be able to produce a complete and reliable document as the template already has all of the details you need in it. Well, I think that is a lot of advantages and there are still more. This is how convenient and reliable audit templates are. 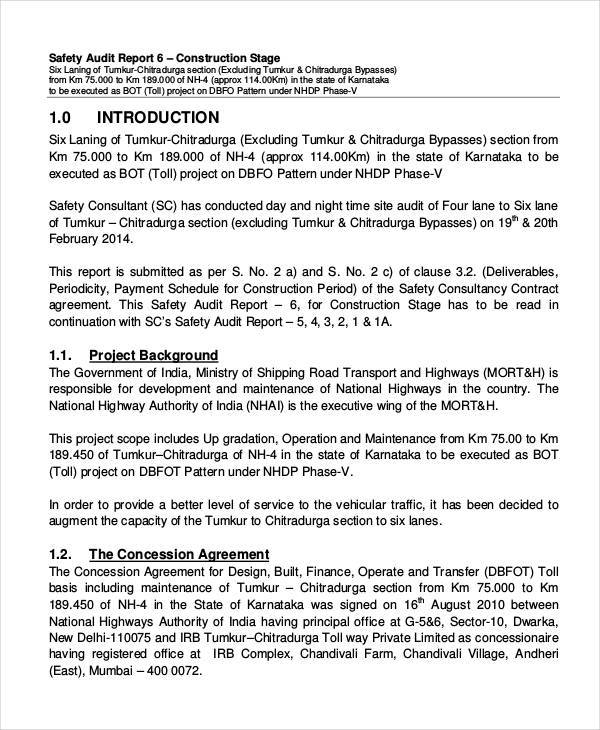 More audit report templates and other related articles are available on our website. To name a few of them are HR reports, risk assessment reports, and committee report templates.